Want to switch up your Thanksgiving dessert a little this year? 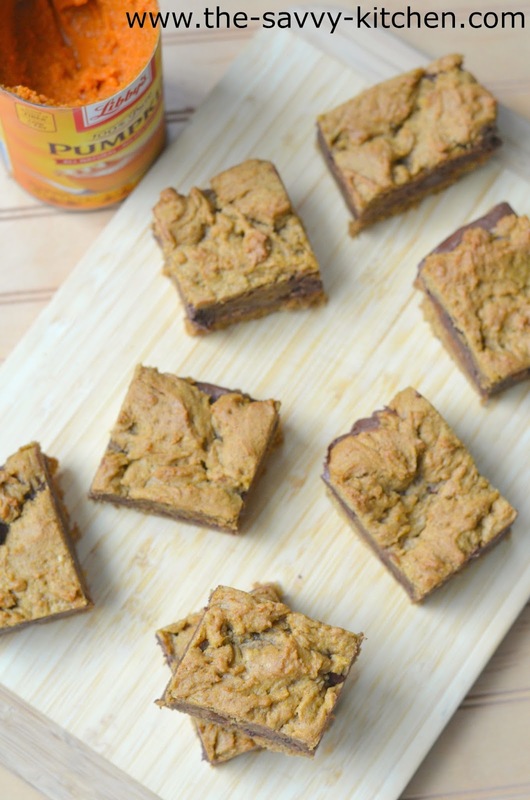 You should make something that still includes pumpkin…but also includes NUTELLA!! Sounds like a winner, doesn't it? 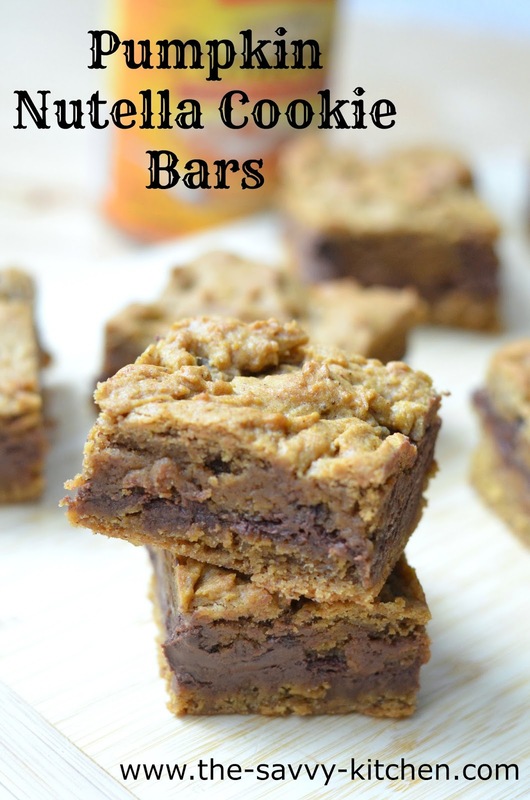 Cookie bars are exactly what they sound like: a moist cookie-like dessert that is made into thicker bars. And then stuffed with Nutella :) They would be great on your Thanksgiving table and a surprising new treat everyone will enjoy! Preheat oven to 350 degrees F. Line a 9x9” pan with foil and spray with cooking spray. Place melted butter, pumpkin, and both sugars in the bowl of an electric mixer fitted with the paddle attachment. You can also use a hand mixer, if you prefer. Mix until smooth, about 30 seconds. Mix in egg yolk, baking soda, salt, spices, and vanilla. Mix in flour until batter is smooth. It’ll be a soft batter. Press half the batter in the bottom of the pan. The batter is sticky so you may want to spray your hands with cooking spray. It’ll be a thin layer in the bottom of the pan. Bake for 8 minutes. Place Nutella in a microwave safe bowl. Heat for just a few seconds until pourable. Pour evenly over the top of the partially baked crust. Spread it carefully so it doesn’t rip the cookie bars. Scoop tablespoons of batter over the top and carefully spread with your fingers. It won’t be a smooth layer but will mostly cover. Bake an additional 17-20 minutes until the top is no longer glossy and the edges are golden brown. Cool completely before slicing.